The Washington DC area is lucky enough to now have it’s own premier destination for niche perfume shopping. 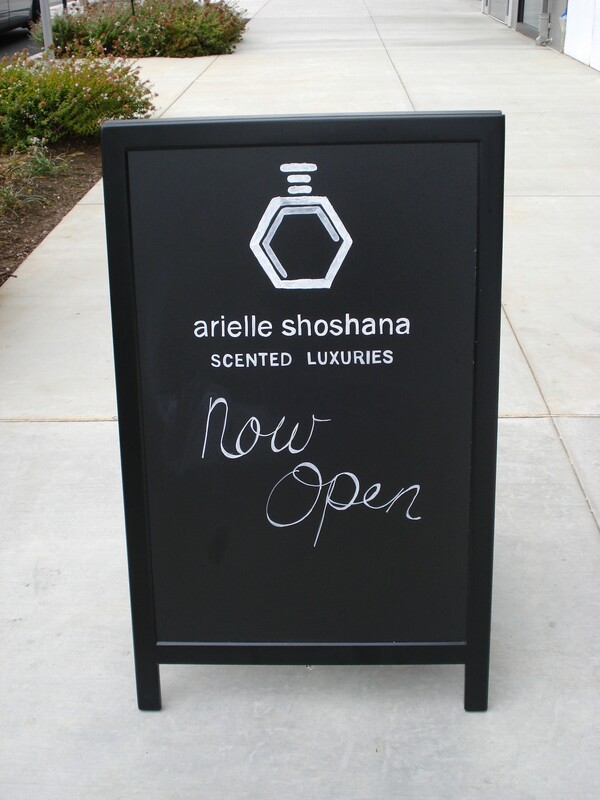 This past Saturday, Arielle Shoshana opened its doors for the first time and the Scented Hound wanted to experience the excitement of this new perfume hotspot. 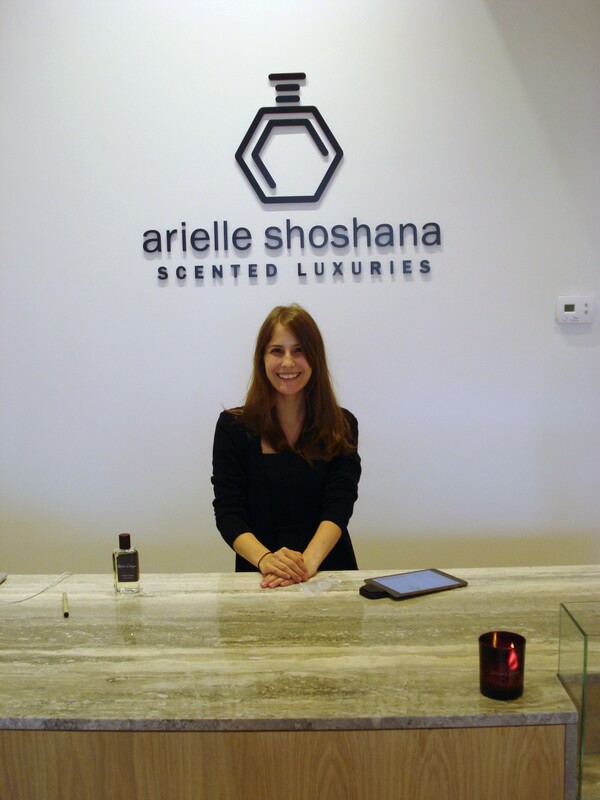 The owner of Arielle Shoshana, Arielle Weinberg, better known as Ari from the Scents of Self perfume blog, worked hard to make this new venture a reality. Located in the very hip and happening Mosaic District in Fairfax County in northern Virginia, Arielle Shoshanna is the right fit for what has been missing from the DC perfume marketplace. The store is beautiful in its simplicity, but luxurious in its appointment. The perfumes are the stars of this new store and rightly so. And of course, when you enter the store, you’re greeted with the smiling face of Ari who lives, breathes and loves this industry and it clearly shows. So what does one do when you go to a beautiful perfume store? You buy perfume of course. Since the better of half of the Scented Hound always complains that he gets my perfume hand-me-downs, Ari walked him through a multitude of perfumes that would fit his personal style and taste. And he walked away with a bottle of Atelier Cologne Cedre Enivrant. The man does have good taste! Of course it was hard to choose the right perfume, because Arielle Shoshana carries some incredible lines. Besides Atelier Cologne, they offer Maison Francis Kurkdjian, CB I Hate Perfume and even Neela Vermeire as well as many others! Thankfully, DC is not the only way to experience Arielle Shoshana, their lines can also be purchased through their website. I took some pictures while we visited,, but they don’t nearly capture the beauty of the store. If you’re in the area, please check them out. And next weekend is the official gala opening which means that party pics will be coming! Congratulations Ari! For more information on Arielle Shoshana, check out their fantastic website! Categories: Uncategorized | Tags: Arielle Shoshana, fragrance, Perfume, perfume shopping, Washington DC | Permalink. I’m sure you know I’m jealous that her store is so close to you. At least I can lend my support via online shopping. My dear… I have no doubt that you will be down here at some time to be able to experience it yourself. It really is a beautiful store. Ari should be really proud of herself for making it happen! Woo hoo. I am green with envy that you got to experience arielle shoshana, One of these days I will make it there! When you do come, you better let me know when your in town! Thankfully Ari has given the area this gift…but you have all of NYC at your feet…how lucky are you??! The coolest. Arielle is so amazing. P – She had a dream and made it happen. She’s awesome! Just visited the store and the first question I asked was: has the scented hound stopped by?! What a lovely place for us all and that blue couch is the perfect spot to sit and chat while things develop on skin. hooray! Hope to run into you there one day. Holly… were you there for the opening last night? Or did you pop on by today? Would love to meet sometime! I was there Saturday afternoon (and I, too, bought something for my partner–etat du libre cologne). But i heard the opening was fun, with a great crowd! Added to the Perfume Shopping around the World page. I hope so too. I think Ari is off to a great start so I have no doubt that Arielle Shoshana will be around for a long, long time! Lucky for me especially since it’s so close by!